I know what you’re thinking. “Brussel sprouts. Yuck.” I’d say yuck too if all I’d ever had was boiled or steamed ones. 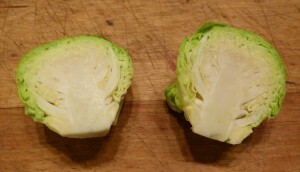 C’mon they’re little baby cabbages and you can have a lot of fun cooking them in different ways. The easiest way to enjoy good, crunchy Brussel sprouts is to roast them in the oven. We’ll save that for another day. Right now I’m going to share a recipe that will make your family coming back for more. I have been making this for years. I think I found this recipe in Southern Living, so I will give them all the credit. The nice thing about this recipe is that you can chop everything up the day before and store in zip lock baggies until you’re ready to cook . Then you’ll have more time out of the kitchen on Thanksgiving to enjoy the Dallas Cowboy game. 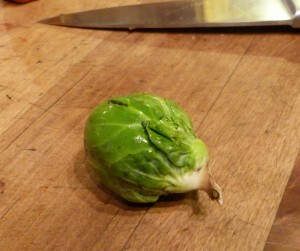 Here’s all you need to make great Brussel sprouts! As for the Brussel sprouts, get the biggest ones you can find. Makes them easier to shred. The tiny ones will drive you crazy. 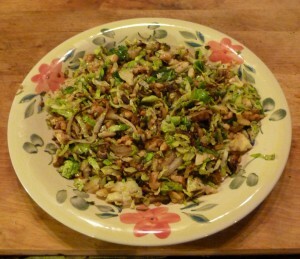 You’re going to shred your sprouts and there’s a trick to this. Then turn it flat side down and slice them from the top to the bottom. Don’t do it the other way, you’ll get clumps instead of shreds. 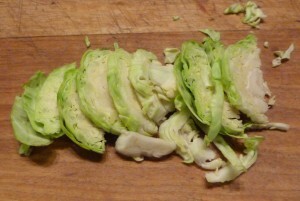 Do this to all your sprouts and you’ll have this. Just looks like cabbage now, doesn’t it? By the way, I did not make the full recipe because I didn’t have enough sprouts around the house and I still can’t see to drive. No problem, you get the idea. Next, take your onion and slice it up. I prefer thinner slices as they caramelize quicker. Next, chop up your walnuts and get ready to cook. 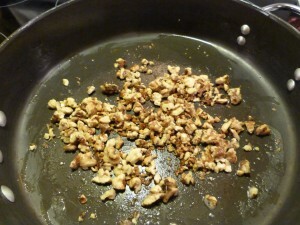 First, quickly brown the walnuts on medium high heat in 1 Tbsp of butter. Come on, it’s Thanksgiving, use the real stuff. Make sure you watch them and keep sauteing them so they don’t burn. It should take 3 to 4 minutes. 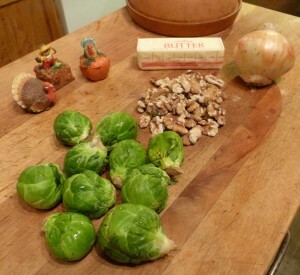 Remove the walnuts and set aside. Add another Tbsp of butter and start caramelizing the onions. 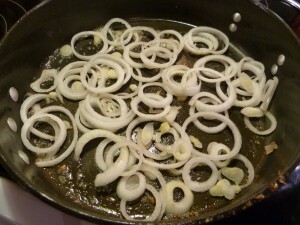 Saute for around 15 to 20 minutes, stirring occasionally until your onions have caramelized and taste sweet. 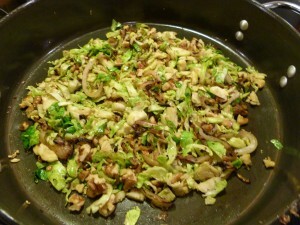 Then add the Brussel sprouts and a little more butter if your pan is too dry. Saute for 3 to 4 minutes. You want the Brussel sprouts crispy. Finally, toss in the walnuts. Here’s the final product. Crispy, crunchy and savory. Yum. Brussel sprouts your family will love! Now here’s the official recipe. 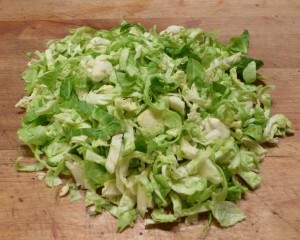 Slice and shred Brussel sprouts. Thinly slice the onion and separate into rings. 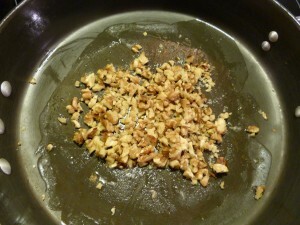 Coarsely chop the walnuts. Heat 1 Tbsp butter in a pan on medium high. Saute the walnuts 3 or 4 minutes until lightly browned. Set aside. 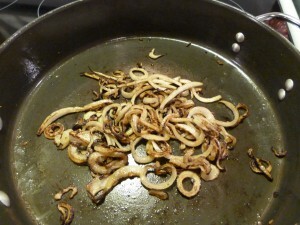 Lower to medium heat, add another Tbsp of butter and caramelize the onions. This should take 15 to 20 minutes. Add the last Tbsp of butter and the Brussel sprouts. Cook quickly, stirring often for 3 to 4 minutes. 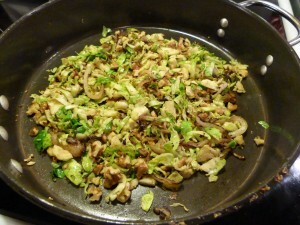 Add the toasted walnuts and toss. Salt and pepper to taste. Serve immediately. Great as leftovers, too. Tomorrow – make a day ahead mashed potatoes. Spreading butter around the world…one calorie at a time.